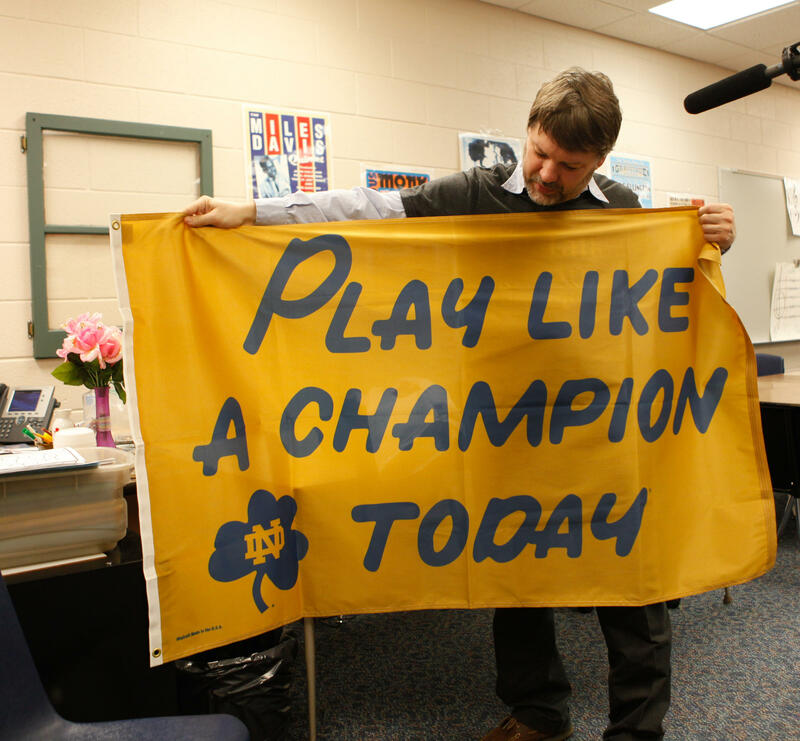 David Reimer incorporates sports into his music teaching. March Madness begins this week. The huge college basketball tournament starts with 68 teams and will eventually end with one national champion. But for some in northern Michigan, March Madness means more than basketball. For 10-year-old Ricky Bristol, who lives in East Jordan, it means practicing his violin. Ricky Bristol, a fourth-grader at Boyne City Elementary, has been motivated by the March Madness Practice Challenge. “I’ve actually practiced every day this week, almost every day last week, every day the week before, almost every day the week before,” says Ricky. Ricky is so diligent in practicing these days because he’s competing in the March Madness Practice Challenge. It’s set up just like the college basketball tournament, whoever practices the longest and the most consistently makes it to the next round. Around 50 students started in Ricky’s group and right now, he is in the Elite Eight. That’s enough to motivate him to practice between 60 and 90 minutes most days. Ricky’s worried if he misses a day, his friend Elijah might catch him. Ricky’s dad Rick Bristol says the competition brings out the best in his son. “The thrill of the competition makes him practice more, and then because he practices more, he sees more success on the instrument,” Rick says. David Reimer is Ricky’s violin teacher and the music director of the Dorothy Gerber Strings Program. He thought of the March Madness Practice Challenge. He says people understand that a high level of effort is required to succeed at sports. Reimer says there are a lot of kids who have the potential to do great things, but the key is keeping them motivated. That’s what this March Madness is about. Parents confirm the practice minutes of their children, which they send to Reimer who tallies up the scores. “I would much rather have a student practice six days a week for 20 minutes a day, than to practice for 70 minutes on Saturday,” he says. Depending on how far a student advances, they could win prizes like an air tour in a small plane, tickets to Avalanche Bay Indoor Water Park, or a gift certificate to a local store. 10-year-old Blaise Sytsma Reed, from Charlevoix, practices her violin. But not everyone is gung-ho about the March Madness Practice Challenge. Blaise Sytsma Reed is a fourth-grader from Charlevoix. “I’m not very motivated by the competition part,” she says. Still, she says she likes charting her practice time and trying to get better each time. David Reimer says it's great for the kids who buy in to the competition, but he's okay with kids who don't. “For the others, we want to keep them engaged, we want to keep the main point, which is developing good practice habits at the forefront and let the competitive side of it slide,” Reimer says. Blaise Sytsma Reed didn’t make it to the Elite Eight round, but Ricky Bristol did. He’ll find out if he made it into the Final Four on April 1. This story appeared in the show Points North. Listen to the entire episode here. A new contemporary music ensemble has formed at Interlochen Arts Academy. On Friday night, the group will perform a piece called “Workers Union,” written by Louis Andriessen in 1975.